Peel and cube watermelon, then add to a blender or food processor and purée until smooth. Pass through a sieve into a mixing bowl, then transfer juice to ice cube tray. Transfer tray to freezer until set. 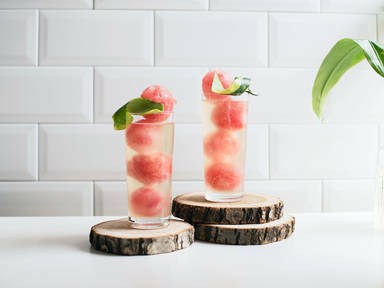 Pour ginger syrup and lime juice into a glass, add some of the watermelon ice cubes, and top with sparkling water and non-alcoholic sparkling wine. Garnish with watermelon peel. Cheers!